Thanks to my wonderful husband, Matt, my blog now looks like a blog instead of a test tube. 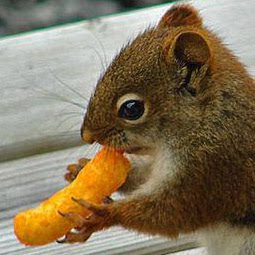 I have totally fallen in love with this little fellow in the photo, munching away on the Cheeto (for breakfast, of course), but he needs a name. Give me suggestions. If I pick yours then I will write a blog post in your honor on the topic of your choice. Rocqueforte (for the cheese) and Rocky (because he's a squirrel) for short. He's so cute! How about C.S. Chewis?